Is Now the Time to Buy Procter & Gamble Co. Stock? The consumer goods giant is beating the market for a change. But at first glance, its shares now look a bit too pricey to open a new position. Procter & Gamble (NYSE:PG) has been a rock for shareholders through the market carnage of the last few months. With the broader indexes down in the neighborhood of 9% since August, its stock has actually risen by 7%. Its deep portfolio of leading consumer staples from paper towels to detergent -- and a huge dividend yield -- likely make P&G more attractive as investors worry about slowing economic growth. But is now really the time to buy the stock? Growth figures are for last two complete fiscal quarters. Source: P&G financial filings and S&P Capital IQ data. Organic sales growth is the most important number in P&G's business, as it forms the foundation for all of the consumer goods giant's profit and revenue gains. The formula is simple: Boost organic sales at above-market rates, which powers strong earnings and cash flow to plow back into the business and send to investors via share repurchases and dividend payments. But that virtuous cycle has broken down lately. Organic growth slowed to 1% in the last fiscal year, down from 3% in the prior two years. The figure then dipped into negative territory a quarter ago before rebounding to a slight gain in P&G's fiscal second-quarter. Annual organic growth. Image source: P&G investor presentation. It isn't just about the weak overall industry, either. Rivals Kimberly-Clark (NYSE:KMB) and Unilever (NYSE:UL) are both booking much stronger growth -- 5% last quarter. P&G executives forecast a slight rebound for its business in the second half of the year, and despite a second straight weak year, they believe they can return to above-average growth over the long term now that the company's portfolio is focused on just the strongest product categories. The good news is that the company boasts one of the most efficient business operations around -- and one that's getting stronger still. Profitability is spiking higher thanks to initiatives such as cost cuts, supply chain enhancements, and working capital improvements. That's not as obvious because weaker foreign currencies have pinched reported earnings results. But back out the affects of the strong dollar, and you'll see that core operating profit margin jumped by 4 percentage points last quarter. 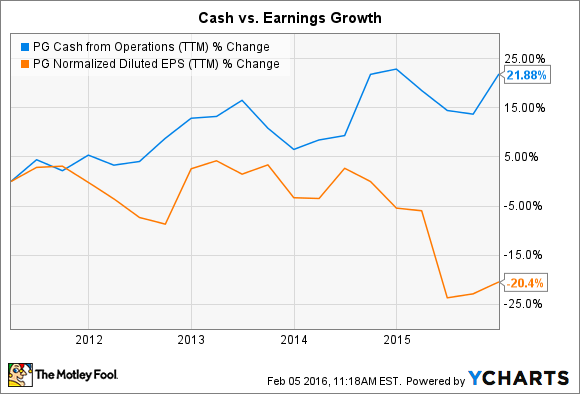 Meanwhile, cash flow is up, even if reported earnings have plummeted . These financial gains are allowing P&G to fund a massive increase in cash returns to shareholders even as reported profit growth stalls. In fact, CEO David Taylor and his executive team raised their annual cash-return target to over $17 billion from the $12 billion per year pace over the last five years. At first glance, P&G's stock looks relatively expensive. Its 3.3x price-to-sales ratio far exceeds Kimberly-Clark's 2.5x and Unilever's 2.1x. Investors also have to pay 28 times trailing earnings to own P&G, compared to a trailing P/E of 23 for Unilever and around 21 for the broader stock market. Yet those sales and profit figures are both under temporary pressure from currency changes, as well as from P&G's effort to shed its underperforming brands. As a result, the stock isn't as expensive as it might seem through these traditional valuation metrics. That doesn't necessarily make it a great bargain, though. P&G is likely to post a tiny sales uptick for the fiscal year that closes in August, which could mark its third straight year of declining growth. But cautious investors might be happy with that weak revenue growth, so long as it continues to support above-average profit improvements.